I did a little tele-workshop last week on Instagram with a group of artists that are being shepherded and mentored by Alyson B. Stanfield. You can’t listen to it yet, but I’ll put it up on the blog when you can. 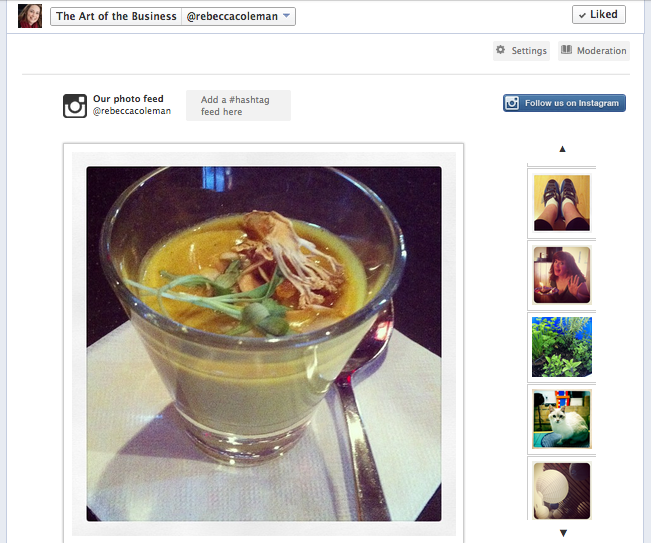 If you’re already using Instagram, you may want to think about adding the Instagram tab or app to your Facebook page. First of all, pushing every single Instagram photo that you take to your FB page may be too much. While you do have the option to share each photo to Instagram, I don’t think it’s a good idea. First off, if you’re anything like me, I take a lot of Instagram photos. Probably around one a day, sometimes more. If you are posting regular stuff to your page, and a photo every day, and, and and… it might get to be too much for your followers. I would not post more than 2-3 times per day to my FB page, and I would make sure that those posts are well spaced out. Secondly, Instagram, like Twitter, thrives on hashtags, but hashtags don’t work on Facebook. So pushing straight from Instagram to FB doesn’t really work in that way. You’re better off to publish your photo to Instagram, then go back and share it to FB after erasing the hashtags, if need be. Having an app on your FB page allows your users or fans to go to it and look at your photos whenever they like. They are in control of how they want to see your Instagram feed, without you pushing it at them. Secondly, you can use Instagram for contests. Create a hashtag for your contest. A few months back, I did one for my client, The Wellness Show. We created a hashtag, #mywellness, and asked people to take photos on Instagram of what wellness looked like to them. They would take the photo, upload it to Instagram, hashtag it, and then we could look at the photos by searching for the hashtag. You can stream your contest’s hashtag through your Facebook page app, as well. Cool, hey? Here’s more information about how to host a contest on Instagram. Thanks for this post. I now have Instagram (which I use way to much) on my FB page.